My friend, Paul, picked a winner this month. I have my Dining Out Meetup group, but Paul has had his Epicurean group for over four years now. This month his choice was La Flor - a place that serves both Mexican and Salvadoran foods. Paul had set up his event for a Salvadoran experience. He arranges with restaurants for a set menu and thus a set fee. While we waited for everyone to arrive we snacked on chips and salsa. Finally the first plates of appetizers came out. 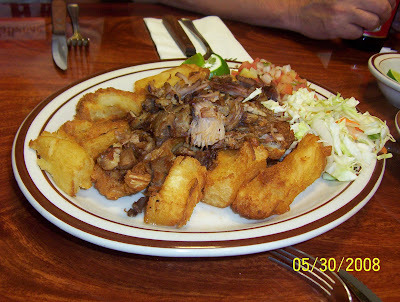 The first one was Fried Yucca Root with chicharron and pickled cabbage (chicharron=deep fried and seasoned pork). Also on the plate was a pickled cabbage slaw mix and some pico. The yucca was cut like large fries and were so tender that they were just like eating French fries. We all wanted more. The second plate was of fried plantains served with beans and sour cream. I'm not a plantain fan, but these were nice and sweet ones. They sent out another plate loaded with their version of empanadas. I'm used to meat filled ones, but these were sweet ones. The exterior was made from mashed plantain. One was filled with a custard and the other was filled with a sweet bean. These were deep fried and sprinkled with just a little sugar. It was a little odd to get this sweet dish before the entree, but I think they were also trying to give us something because the entrees were taking a while. Each were wonderful, although different. The custard one was obviously moister than the bean one. But the bean was not dry because of the moistness of the plantain casing. 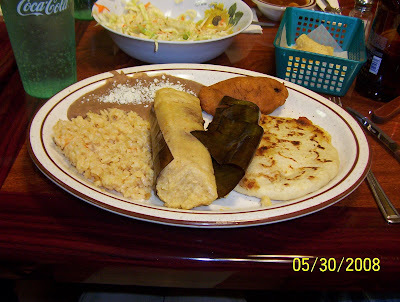 The entree plates consisted of a pupusa, a Salvadoran tamale, a Salvadoran pastel, with rice and beans. A pupusa is a tortilla that has been filled with cheese and maybe something else. We were given choices of pupusas and I chose the cheese/chicken one. I then topped mine with some of the slaw and the salsa. The pastel was what I normally think of as an empanada, meat and potato filled and deep fried. I've also never been a fan of tamales, but I had a nice pork one on my plate. I couldn't even touch the rice and beans because I was so full from all these items. Everything was delicious.